New! 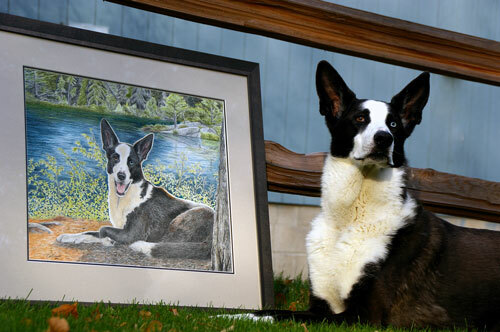 You may now order matching pet portrait cards and prints! Click here to read more. Before contacting me, please read the information below to help you determine the price/size, medium (drawing or painting) and composition of your portrait. 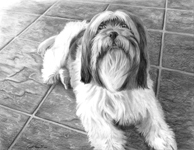 If you are still not sure, send me your pet photos and I will be happy to help you determine the best portrait for you. 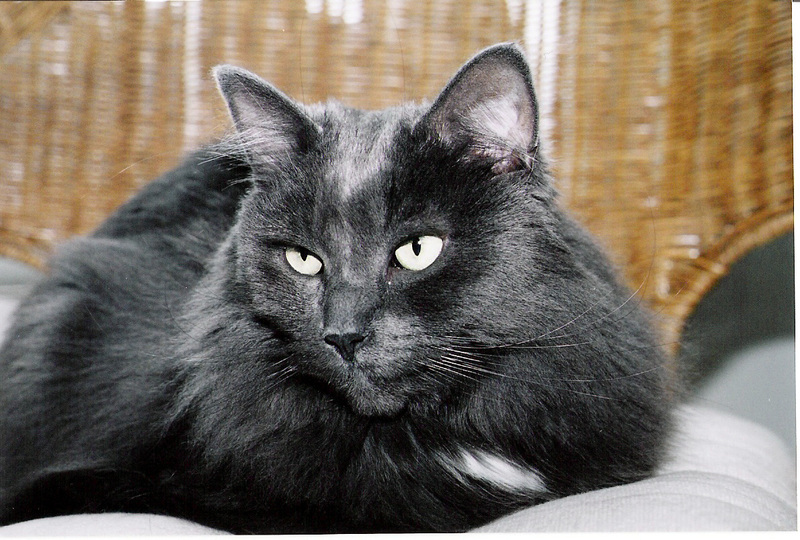 Feel free to email me images of your pet, preferably in jpeg format. Quotes will be honored for 30 days. You will be given a priority rank number that reflects the number of portraits to be completed before your portrait (for example, a rank #3 means there are 2 other portraits ahead of you). A 35% deposit is required to reserve your rank number. SIZE: Generally, the smallest size of a "head and shoulder" portrait I work with is 8" x 10". The size of the artwork may need to be larger, depending on the number of subjects to be included in the artwork, the orientation of the subject and the subject matter. It is also much more difficult to show all the fine details when the subject is significantly reduced in size. Another reason for increasing the artwork size is the number of subjects to be included. Imagine 2 or 3 dogs crowded together on an 8"x 10" portrait. Again, important detail would be lost and the size of each subject is again drastically reduced. However, keep in mind that these are general guides and all portraits are geared to the chosen pose and your personal preferences. For simplicity, I have listed some common standard sizes below. However, I can draw your portrait any dimension you require. COMPOSITION: Any combination of animals can be included in an artwork. Study portraits, montages, and multiple subjects are examples of different artwork compositions. Don't be shy to share your suggestions! ORIENTATION: Several factors are considered when determining if a portrait should hang vertically (tall) or horizontally (wide). The composition, number of subjects, the conformation of the subject and type of pose are some factors that are considered. Other factors could also include the location where you plan to hang your portrait, or simply your personal preference. No need to worry; I will be more than happy to help you in determining the most aesthetically pleasing orientation for your portrait. BACKGROUNDS: I can add a "hint" of background to the artwork or create a more detailed one of your choice. PHOTOGRAPHS/DIGITAL IMAGES: In order to render the most realistic portrait, good quality photographs are required. High resolution digital images are best but I can also work with traditional photographs as long as they are suitable. A portrait can also be created from several "not as good" poses or shots. If at all possible, I do need at least one good photograph showing the eyes. However, do not despair if you don't have any great pictures. 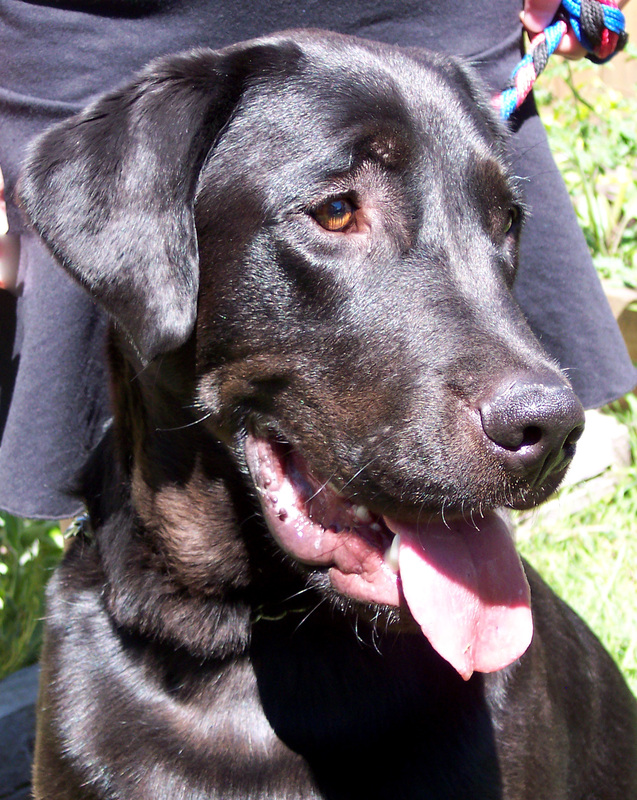 I can work with what you have along with verbal descriptions of your pet. 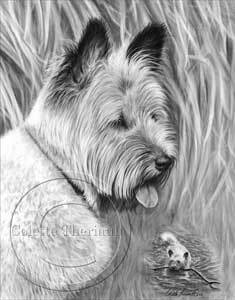 Many of my work involves beloved pets that are no longer alive and one of the reasons the client wants a portrait is because they don't have any good photos. For helpful tips on how to take (or choose) suitable photographs for your portrait, please see the Photography Information Page here. 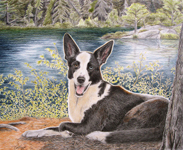 VIEW THE PROGRESS OF YOUR PORTRAIT: You will be able to view the progress of your pet portrait as it is created on the Work-in-Progress pages of my website. I will also send you several updates in jpeg format (via email) of the work in progress. The portrait is not complete until you approve a final proof. TERMS AND CONDITIONS: The client agrees that all reference work provided to the artist for the creation of the commissioned portrait is free and clear of all copyrights, and the client agrees that the client will be responsible for any legal actions taken by others for use of photo material that is not free and clear of all copyrights. Artwork is commissioned for personal use only and may not be used for financial gain. 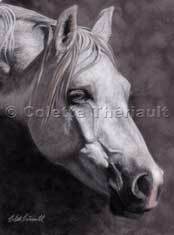 In addition, I retain full reproduction copyright on all my artwork whether commissioned or not. Artwork and images may not be used or reproduced without my written permission. Pricing: Please note that prices may be subject to change without notice. Express shipping (includes insurance) is extra (normally ranges from 15-30$). To ensure the best preservation for your artwork, each piece is drawn on acid free paper (to prevent yellowing) and pencil drawings are protected with a fixative to prevent smudging. Artwork is shipped flat, not rolled. PAYMENT INFORMATION: The preferred method of payment is PayPal. Once you have contacted me and the portrait details have been determined, you will be sent an email invoice. If you prefer, you may also pay using a Canadian or United States International Postal Money Order (pink/orange form). Please contact me for details. 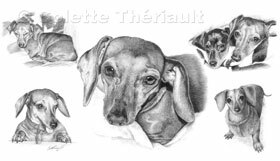 Each pet portrait is highly detailed and an enormous amount of work is required to complete each one. Due to the amount of work involved in creating your portrait, I require a 35% deposit. The deposit is non-refundable after the portrait is reasonably advanced. 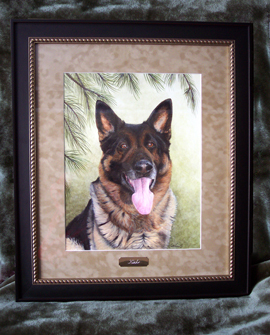 The balance of the payment is not due until you have approved a final proof of the finished portrait. Very simple to make, payments are made by following the instructions on your "payment request" email. For gift certificates, simply send the amount requested via email and I will send you a Paypal invoice (via email) for the appropriate amount. You may also purchase gift certificates of fixed amount here. Your gift certificate will then be mailed to you or directly to the recipient if you so choose. If time is short and you need the gift certificate right away, I can email you a jpg file as an email attachment and you can print it at home. Please note: Gift certificates are valid for 1 year from the date of issue. Gift certificates have no cash value which means they are non-refundable. SHIPPING INFORMATION: As soon as I receive the final payment for your artwork, it will be shipped via Canada Post Expedited or ExpressPost. All artwork is shipped flat (for safety reasons, I do not ship framed artwork) and will be well packaged to prevent any damage to it during transit. All artwork is insured against loss or damage during transit and you will be provided with a tracking number for your parcel. For artwork shipped to the United States, please note that there currently is NO duty or border fee to import original works of art from Canada to your country. For more information, feel free to visit the US Customs and Border Protection website or read the Harmonized Tarrif Schedule of the United States (PDF) as provided on their website. 100% SATISFACTION GUARANTEED: Your satisfaction is of highest importance to me. I trust the quality of my work will satisfy even the highest demands. However, if you are not completely satisfied with your commissioned portrait I will work with you until it is to your liking. 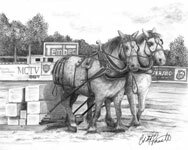 All other artwork purchased on this site must be returned at buyer's expense in original condition within 30 days in order to receive a refund. You must contact me prior to returning the artwork to me. Completion time for portraits: typically four to eight weeks depending on complexity, number of subjects, portrait size and current workload.